For your entertainment. 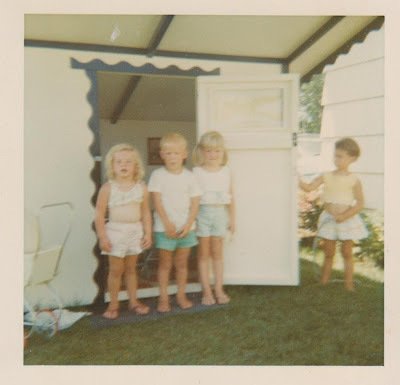 A photo of me entertaining guests at the very first house I owned. Note the dutch door, the wide eaves, and the intricate exterior trim. A birthday present from my mom and dad who were tired of listening to me whine about how near death I came during the long hour(s) it took me to mow my lawn this summer. Funny little story. I immediately tried out the new mower while my mom and dad were still at my house after delivering it. The box said it was self-propelled and I was thinking to myself as the mower glided over my overgrown grass how much of a huge difference the self-propelled technology made. I stopped the mower to move my hammock to the other side of the yard..and commented to my mom how easy it was. I had to laugh when she said "...and it will be even easier when you pull up on the self-propeller bar." I am now practically running after this mower. If I could teach it to turn corners, I'm pretty sure it would mow the lawn itself.